Cats are independent, territorial animals that need to be in control of their surroundings. They are also very sensitive to different smells. These things can make visits to a vet clinic stressful. All our branches have been independently certified as Cat Friendly by the International Society of Feline Medicine. We have made several changes within the practice to reduce stress in cats during their visit to us, but there are also lots of things that you can do to help. Choose a good carrier. It should be robust and easy to clean (plastic or plastic-coated). Top-opening carriers are much easier – the cat can be gently lifted in or out. 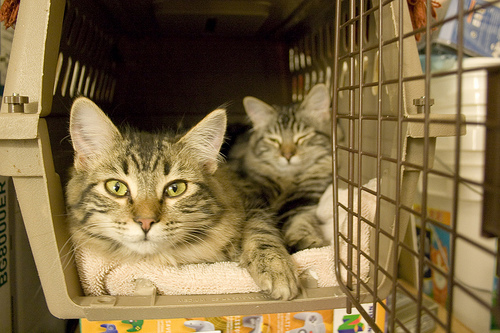 Use the carrier at home – encourage your cat to sleep or be fed in the carrier, so it does not only appear when there is a visit to the vet, or cattery. This means that the carrier itself will not be a cause of stress and will actually become a familiar den. Cover the carrier with a blanket, or towel, during the journey to keep the cat calm. Always hold the carrier carefully – avoid swinging it or banging it against objects. Ideally, place the carrier on a car seat, facing forwards and ensure it is level (place a rolled up towel under the back of the carrier). If this is not possible, secure the carrier firmly in a footwell. Secure the carrier well so that it cannot move – use a seatbelt. Familiar smells will make your cat less stressed. Put bedding, or clothing, that smells of home in the carrier. Rub a cloth around the cat’s face to pick up scent, then rub this around the carrier and leave it inside. Spray the carrier with Feliway (synthetic cat pheromone) and/or Pet Remedy (a natural valerian extract) 30 minutes before using it. If your cat panics, wrap him/her in a thick blanket and put both in the carrier. all our reception areas are divided into separate cat and dog waiting areas. If you do wait with your cat in our reception area, please keep the carrier on your lap, never on the floor and always keep it covered. If there is room, you are welcome to use the seat next to you.